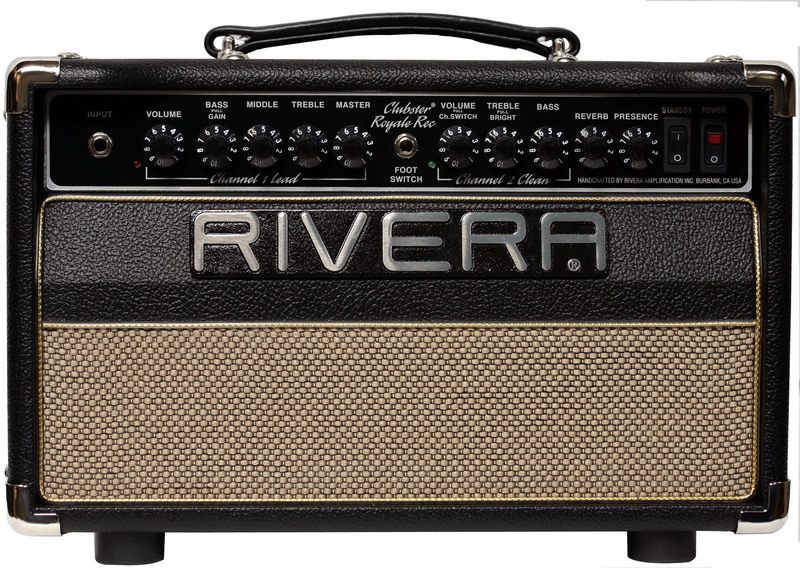 Meet Rivera's more affordable and flexible, dual channel Clubster Royale Recording! Now get killer real all tube tone direct!!! Featuring the Mini-Rockrec built in and revoiced to sound like our legendary original Knucklehead. 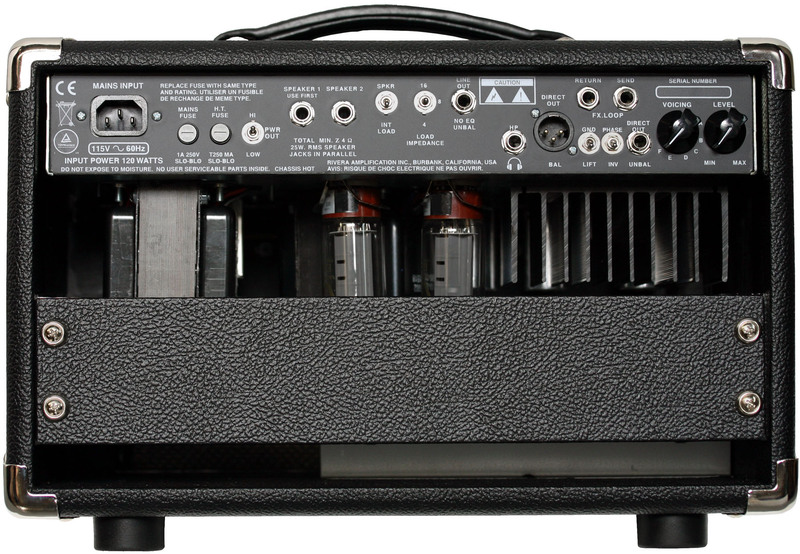 This little compact flexible head is a mega tone beast and perfect for fly dates! Available in 50watts with EL-34's or 25watt with 6V6's. Luscious foot-switchable spring reverb included. The New Clubster Royale Recording features two discrete preamp foot-switchable channels powered by 3 12AX7 tubes, an active effects, and a larger output transformer with an impedance selector. This new 50watt powerhouse of EL34 Tube tone will give you the chunky bottom end, clean rhythms, and sweet sustain and distortion to satisfy your musical desires. The new Clubster Royale Recording also features our Mini-Rockrec which gives you 6 killer speaker voices for direct recording, a NO EQ OUT to be used with IR’s, Headphones Out, a half power switch (25/12 for the 25watt version and 55/25 for the 55watt version), phase switch and more! 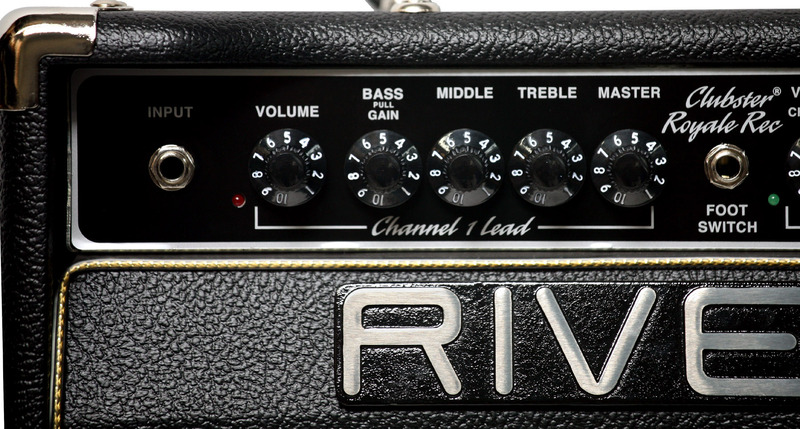 High gain lead tones in Channel 1 are articulated with 3 band equalization, and a Pull for Boost switch gives you that extra gain to go from crunch to searing leads. Channel 1 has also been re-voiced like the original legendary Knucklehead…..Ultra smooth gain with great definition. 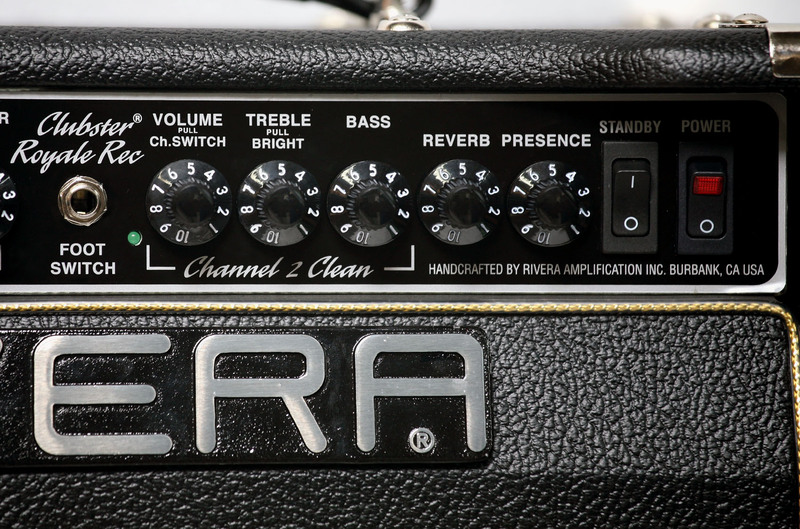 Channel 2 is a straight forward rhythm channel with 2 band equalization and a bright switch, voiced like the vintage blackface amps from 1965. Featuring the rich and lush foot-switchable Accutronics® 3 spring reverb to add depth and swell to your tone and active effects loop. The heavy duty and oversized output transformer features low temperature running and super tight bottom-end. There’s two speaker jacks and an impedance selector for easy and correct matching of external enclosures. 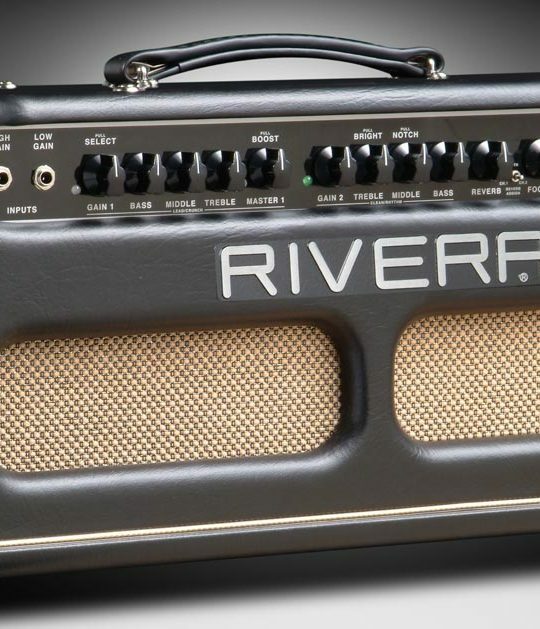 Like all Rivera® amplifiers, they are built with military and audiophile grade components, and lovingly handcrafted in Burbank, California. 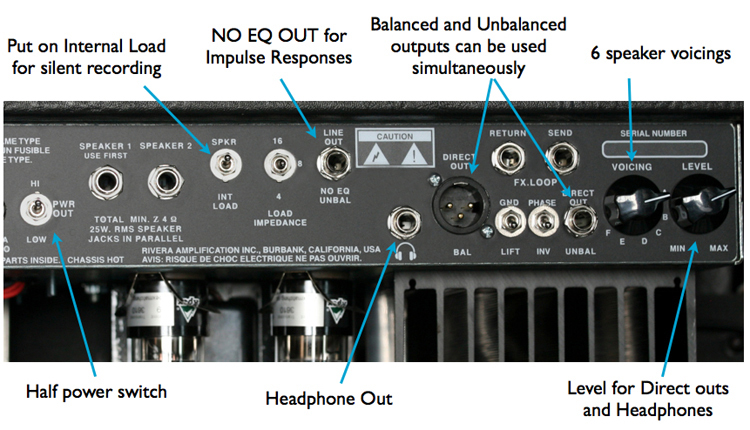 Rear-panel inputs and outputs: 1/4″ effects loop send and return, 1/4″ line out NO EQ, XLR balanced output, 1/4 Direct Out unbalanced, (2) 1/4″ external speaker outputs. Output tubes and power: 55watts with EL-34’s 25watts with 6V6’s. Mega heatsink for the reactive/inductive load and network to keep cool and reliable running. 16.5W x 10.75H x 10D, 28lbs (55watt version) and 24lbs (25watt version). Fits between rack ears for easy travel. ©2019 Rivera Amplification · Design and Hosting by New Level Graphics.